APRIL 15, 2019: HOUSTON, TEXAS – Vitacca Dance Artistic Director and Founder Kelly Ann Vitacca develops a community dance initiative designed for Houston dance artists, Texas, and national communities. The Geraldine M. Vitacca Emerging Artists Sponsorship Program, is designed for aspiring dancers pursuing a professional dance career. Sponsorship applications are due Monday, April 22 and recipients will be notified on Monday, April 29. All 2019 sponsorship recipients are invited to perform a solo work in the Emerging Artists Festival on Saturday, May 4, 2019 at 7:00pm at the Charles Bender Performing Arts Center. 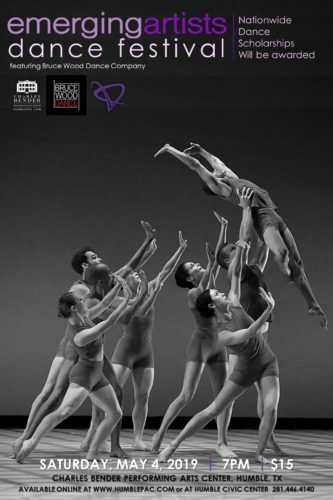 Bruce Wood Dance of Dallas will be the professional company featured at the festival.Find out more at www.vitacca.org. On May 4 at 7:00pm, Sponsorship Recipients share the stage with pre-Professional and second companies including: Vitacca Dance Montrose, MET too of METdance, Noble Motion Dance 2, CSquare, LEON Dance Arts and Ad Deum II. Bruce Wood Dance will be the featured professional company of the 2019 Emerging Artists Festival. Described as “emotionally charged and highly kinetic” by ArtandSeek.org, BWD was named “Best Dance Company in Dallas” by D Magazine in 2013, 2014, and 2017; awarded “Best of Dallas Voice” annually since 2014; and appointed to every regional Top Ten list since 2011. Leading the company into its ninth year, Joy Bollinger is committed to BWD’s mission to present high–caliber, original, contemporary choreography that harnesses the power of dance as a tool for entertainment, enrichment, and healing. Fortified by Bruce Wood®’s aesthetic, BWD produces and maintains his repertoire, commissions new work by resident choreographers and guest dance–makers, and contributes to the quality of life in Dallas–Fort Worth, Texas, and across the nation. Upcoming 2019 biannual productions take place June 14+15 and November 15+16 at Moody Performance Hall. Description: The Charles Bender Theatre along with Vitacca Dance Montrose present the Emerging Artists Dance Festival. This evening provides a platform for pre-professional artists and companies to present their works on stage. Sponsorships to training programs will be awarded (Audition Video and Application required). Bruce Wood Dance Company of Dallas will be the professional company that will be featured that evening.